Eight years ago today, the US withdrew its military presence (at least the non-secret part) from its ally, and the world’s top oil producer, Saudi Arabia. “Big deal”, you may say. But this event is a crucial one in the global war that America has been pursuing since (at least) 9/11. The facts behind 9/11 and the ensuing “war on terror” have been lost in the fog of US propaganda in the past few years. Perhaps the most important fact-they-want-you-to-forget is this: Al Qaida’s attack on 9/11 was in protest at the presence of US troops on Saudi soil. At the time of the 9/11 attacks, the US was occupying Saudi Arabia with between 5,000 to 10,000 troops. Osama bin Laden’s strike was aimed at ending the US occupation as a step to overthrowing the Saudi dictatorship. This was never made clear to the American people, who were instead told by Liar-In-Chief Donald Rumsfeld that Al Qaida was a huge, global organisation that wanted to destroy America’s way of life (this was true only to the extent that America’s “way of life” included the forcible creation of an Empire including the oil-producing Arab lands). But our correspondent says the US troops have become a potent symbol of Washington’s role in the region, and many Saudis see them as proof of the country’s subservience to America. Saudi Arabia is home to some of Islam’s holiest sites and the deployment of US forces there was seen as a historic betrayal by many Islamists, notably Osama Bin Laden. It is one of the main reasons given by the Saudi-born dissident – blamed by Washington for the 11 September attacks – to justify violence against the United States and its allies. 9/11, however murderous and unjustified, wasn’t an unprovoked attack, but a response to long-standing US aggression against Arabs, and Saudis in particular. 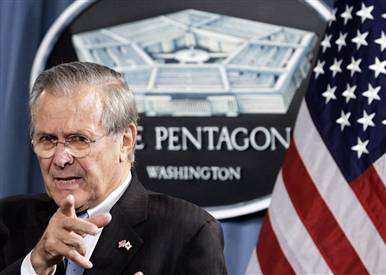 The “war on terror” was of America’s choosing; Rumsfeld and the neocons deliberately confused the issues in order to create a new, never-ending version of the Cold War. America’s perpetual war will run until America ends it – and while it runs, the risk of terrorist attacks on the West climbs ever higher. The US has chosen to roll the war out to Afghanistan, Pakistan, Iraq, Somalia, Yemen and now Libya. This is never in response to aggression and always in pursuit of expanding the empire. The war isn’t being conducted by “Al Qaida”, “Terrorists”, “The Arabs”, “The Muslims” or “Islam” – it’s America’s war and will end when America chooses. You’re wondering why the US withdrew? Because a month earlier, it had invaded Iraq with the goal of creating a large, stable and permanent military presence there – the after-effects of which we’re still feeling worldwide. 9/11 is one of the most significant events to affect America in the past few decades; and yet so few Americans seem to understand why it happened, or know anything about the events leading up to it. On September 11 last year, I posted one tweet per hour throughout the day on the subjects of 9/11, terrorism, the so-called “war on terror”, and world events in the preceding decades that played a part in building up global anger towards America. I’d like to thank @dbudlov, a twitter user who has collated my 24 tweets into one block, and regularly reposted them to Twitter; here’s the whole set of tweets, with extra notes added in italics. (It’s amazing that Bush/Rumsfeld ignored this point, and most commentators still do. The attackers weren’t a mix of “Muslims” or “Arabs” – they were almost all Saudis, as is Osama bin Laden). 6) The Taliban were never involved in the 9/11 attacks, although this was never made clear by the Bush admin. 16) Both Saddam and bin Laden were American agents who went astray – pick your friends more wisely? 23) In 2001 Rumsfeld said Al Qaeda had 100,000 followers. In reality, less than 1,000. The lie of the decade?